No need for a carbon sheet between the pages to create a duplicate. 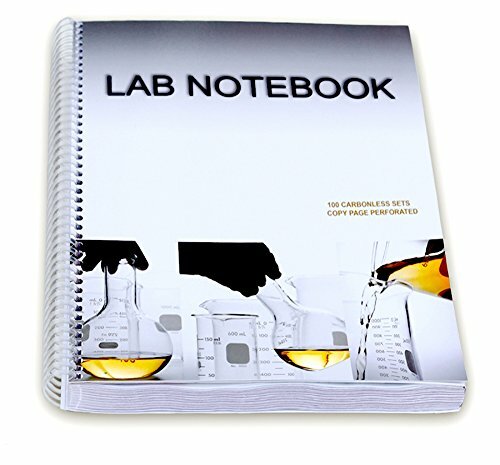 These are carbonless self-copying pages (each page has a self duplicating page), 1/4 inch graph paper, all pages consecutively numbered, copy page is perforated for easy tear out, top page stays permanently in the notebook. Both the top page and the copy page are white for better clarity. Record of contents page to log lab experiment information, lab safety rules page, scientific reference information printed on the bi- fold back cover (ex: Most up-to-date periodic table, scientific formulas, conversions, etc.). Spiral bound, durable laminated on both sides cover. If you have any questions about this product by BARBAKAM, contact us by completing and submitting the form below. If you are looking for a specif part number, please include it with your message.